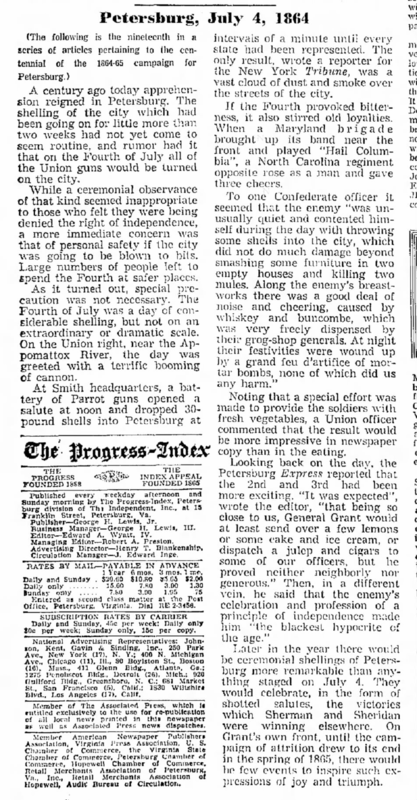 A century ago today [July 4, 1864] apprehension reigned in Petersburg. The shelling of the city which had been going on for little more than two weeks had not yet come to seem routine, and rumor had it that on the Fourth of July all of the Union guns would be turned on the city. While a ceremonial observance of that kind seemed inappropriate to those who felt they were being denied the right of independence, a more immediate concern was that of personal safety if the city was going to be blown to bits. Large numbers of people left to spend the Fourth at safer places. As it turned out, special precaution was not necessary. The Fourth of July was a day of considerable shelling, but not on an extraordinary or dramatic scale. On the Union right, near the Appomattox River, the day was greeted with a terrific booming of cannon. At [Eighteenth Corps commander William F. “Baldy”] Smith[‘s] headquarters, a battery of Parrot[t] guns opened a salute at noon and dropped 30-pound shells into Petersburg at intervals of a minute until every state had been represented. The only result, wrote a reporter for the New York Tribune, was a vast cloud of dust and smoke over the streets of the city. If the Fourth provoked bitterness, it also stirred old loyalties. When a Maryland brigade brought up its band near the front and played “Hail Columbia”, a North Carolina regiment opposite rose as a man and gave three cheers. Noting that a special effort was made to provide the soldiers with fresh vegetables, a Union officer commented that the result would be more impressive in newspaper copy than in the eating.